4" Flowering Dogwood Tree - Superbly handcrafted with a textured wood trunk, plastic 'branch-like' limbs with delicate floss structure and white SuperLEAF blossom flake. Every tree has a tapered spike for easy planting. 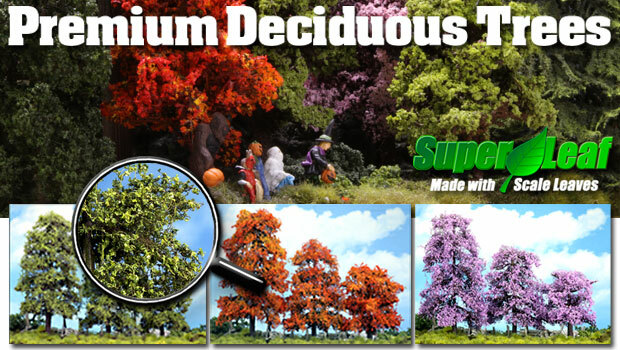 4" Autumn Maple - This tree offers a textured wood trunk, plastic 'branch-like' limbs with delicate floss structure and red/orange 'SuperLEAF' flake. Every tree has a tapered spike for easy planting. 4" Flowering Redbud Tree - This tree offers a textured wood trunk, plastic 'branch-like' limbs with delicate floss structure and peony pink 'SuperLEAF' blossom flake. Every tree has a tapered spike for easy planting. Made in the USA! 4" Golden Poplar Tree - Rich yellow gold colors permeate this tree. Handcrafted in the USA with a textured wood trunk, plastic 'branch-like' limbs with delicate floss structure and yellow gold 'SuperLEAF' flake. Every tree has a tapered spike for easy planting. 4" Japanese Cherry Tree - Textured wood trunk, plastic 'branch-like' limbs with delicate floss structure and pink 'SuperLEAF' blossom flake. Every tree has a tapered spike for easy planting. Made in the USA! 4" Basswood Tree - Handcrafted in the USA with a textured wood trunk, plastic 'branch-like' limbs with delicate floss structure and light green 'SuperLEAF'. Every tree has a tapered spike for easy planting. 4" Eastern Sugar Maple Tree - This tree has a hand-textured wood trunk, plastic 'branch-like' limbs with delicate floss structure and medium green 'SuperLEAF'. Available in 3 sizes. Every tree has a tapered spike for easy planting. Made in the USA. 4" Oriental Red Maple -This tree has a hand-textured wood trunk, plastic 'branch-like' limbs with delicate floss structure and deep red 'SuperLEAF' flake. Every tree has a tapered spike for easy planting. Made in the U.S.A.
4" Arkansas Black Oak -This tree offers a textured wood trunk, plastic 'branch-like' limbs with delicate floss structure and dark green 'SuperLEAF'. Every tree has a tapered spike for easy planting. Made in the USA. 4" White Dogwood - Add the highlight of brilliant white petals to otherwise dull scenery. Our 4" tall white dogwood with its bright SuperLEAF foliage and twisted gnarly trunk will sure please the most dowdy modeler! 4" American Beech Tree - They are ideal shade trees. Beech trees have long branches that create a large, dense shade canopy. Our 4" tall American Beech has medium green "SuperLEAF' flake and twisted gnarly trunk. 4" Redbud Tree - This 4" tall Redbud is in its full bloom with its renown 'shocking' pink 'SuperLEAF' blossoms. This tree has a gnarly trunk with heavily textured bark. 4" Delicious Apple Tree - A tree loaded with its bright red fruit of season. This old 4" tall red delicious apple tree shows its age with gnarly trunk and textured bark. Medium green 'SuperLEAF' covers the transparent canopy. Scale red delicious apples adorn the lower limbs ready to be harvested. 4" Crepe Myrtle Tree - Known for its vivid fuchsia flowers that last the entire summer season. Green 'SuperLEAF' covers the delicate canopy and fuchsia flowers are placed with precision to assure a natural look.